Only the man in charge of the single lamp at the North Pole and his colleague responsible for the single lamp at the South Pole could enjoy a carefree life of laziness: they only worked twice a year. "I must endure the presence of two or three caterpillars if I wish to become acquainted with the butterflies." For we must end on the road to that mystery where courage, death, and the dream of love give promise to sleep. 1. Those that were written during and for that period, such as Stranger in a Strange Land, Catch 22, One Flew over the Cuckoo's Nest, The Harrad Experiment, Slaughterhouse Five, and Zen and the Art of Motorcycle Maintenance. 2. Those that had been written earlier but became popular in this period, like The Hobbit, Lord of the Rings, The Little Prince, The Doors of Perception, Steppenwolf and everything else by Herman Hesse. Both groups of books tapped into veins of dissatisfaction with mainstream mores. But you may immediately note a difference here. The anti-establishment novels produced during that time tended to represent youthful rebellion against old political and sexual morality. The earlier-produced works that gained new life in this period were not concerned about such passing matters but dealt with the supposedly larger search for meaning in life. The establishment they opposed was the rule of cold practicality, nonhuman values, and narrow-minded self-interest. The alternative they promoted was not liberation so much as the cultivation of each individual's soul and the engendering of life-affirming relations, bordering on or crossing over into mysticism. Of course I am exaggerating this distinction. There's a great deal of overlap between the categories and not all the works mentioned can be summed up so succinctly. 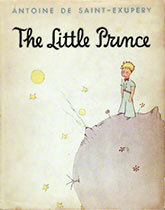 But The Little Prince does fall squarely into the latter group. It may be the simplest, most primitive representation of this viewpoint. The simplicity perhaps comes from its supposedly being written for children. I don't know if this is true. I doubt the characters and storyline would be particularly entrancing for kids compared to other entertainments today. What gives people the idea that it's a kids' book may be that much of The Little Prince is presented as the views of a child—albeit a child from another, very tiny planet. It abounds in lines like "Grown-ups never understanding anything by themselves and it is rather tedious for children to have to explain things to them time and time again" and "Only children know what they are looking for". Not to mention the fact that the text is interspersed with hand-drawn sketches by the author. It is also quite simply written, which is always a plus for readers of any age. But The Little Prince is not really for kids. Rather it's intended to encourage adults to be like kids. I'm not going to get into the book's ideas. Frankly they bore me. It's healthy to look at life from various perspectives, including the naïve view, to shake up and question one's own assumptions about what is important. But I doubt this viewpoint provides an ongoing guide to living, as its most fanatical fans seem to believe. Or once seemed to believe. I'll leave it at recommending The Little Prince as an enchanting story you can enjoy from time to time and make of what you wish. The available translations into English are all acceptable, with slight stylistic differences that do not greatly affect the enjoyment of the book. Important if you want to get your quotes right though.